And it starts with treating them fairly. Last month, Saudi Arabia went on a diplomatic blitz, expelling Canada's ambassador, halting trade agreements and ordering every Saudi citizen with government ties to leave the country within a short period of time. The citizens affected are a diverse group. From diplomatic officials working at the embassy, to patients receiving treatments in Canadian hospitals... to students. A majority of the 8,300 Saudi Arabian students studying in post-secondary institutions across Canada are here on government scholarships. By rescinding these funds, the Saudi government puts the students in a terrible situation, forcing them to acquiesce to the demands of their benefactors. Canadian institutions are forced to exploit international students to make up for cuts to government funding. There is speculation about the impact the students' departure will have on the schools' revenue streams. Institutions with hundreds of Saudi students are anticipating the loss of several million dollars and a substantial blow to their subsequent revenue as the students will be likely banned from studying in Canadian schools for the foreseeable future. Some argue that this incident should teach Canadian institutions to diversify their international student population. With some schools depending on students from certain countries to fill its international student quota, another diplomatic crisis of this nature could send revenue tumbling. But what this situation is exposing is the fact that Canadian institutions are forced to exploit international students to make up for cuts to government funding. On average, international students pay 3.7 times more than Canadian students in the same institutions. And this figure has been steadily rising as a result of unfettered international tuition increases. Since 1995, the Canadian government has implemented a habit of slashing government funds to post-secondary institutions, forcing them to depend on international students as a source of funding. It's the perfect strategy. 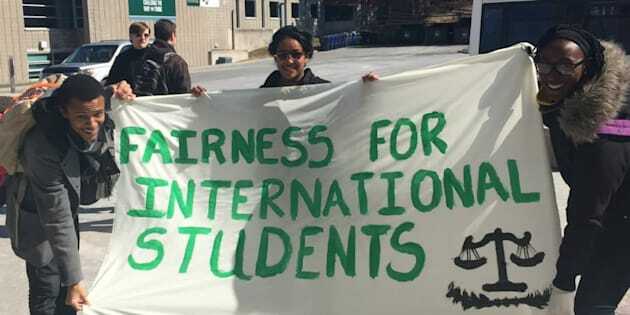 International student fees can be increased without a limit, allowing schools to dictate their own outrageous costs in order to generate revenue for a woefully underfunded institution. These students are made into cash cows and then, once they accept their government's aid, into unwilling diplomatic pawns. There have been solutions suggested to help the Saudi students stay in the country. Allowing them to keep their student visas, regardless of their rescinded scholarships, seems to be the most popular, along with allowing the students to work more than the 20 hours per week permitted for international students. These solutions, while technically viable, do not address the very real fact that these students and their families are expected to cover average tuition fees of $25,180 per person, in addition to their other expenses. Since the Saudi students were ordered to leave, there has been no official action from the Canadian government on their plight. Doing so could mean two things. First, that the country is encouraging Saudi citizens to ignore their country's orders, which certainly isn't the case. Second, that the Canadian government accepts that international students fees are unreasonably high and that students cannot possibly finance their own education without extensive assistance or immigration concessions. International students contribute billions of dollars to the Canadian economy through the jobs they create and the taxes they pay. They become important members of our community, creating lives here and putting down roots. Maintaining differential fees puts insurmountable obstacles in the way of these students' futures and deprives us of the talent we need to expand our economy. No student deserves to pay $25,000 per year for tuition and, even worse, be used as diplomatic fodder on the world stage. The government should take action to help Saudi students in Canada, and it starts with treating them fairly. By eliminating differential tuition fees and implementing other policies such as providing healthcare coverage and establishing clearer pathways to permanent residency, Canada will demonstrate that we value the contributions of international students and welcome them in our communities. Post-secondary education is a right that everyone deserves. The federal government can and should take up its responsibility of funding Canada's post-secondary institutions as part of its so-called progressive agenda. Saudi students, like all others, deserve better than this.